Hi everyone, I'm Gertrude from "Gertrude's Green Ec'o Towel"! I'm so happy to be here today to share my Ec'o Towels with you. They are natural, bio-degradable, soft and unscented, reusable, compact, easy-to-carry, and inexpensive! You simply add water. They instantly expand and provide a perfect towel (approx. 10.5" x 8.5") for cleaning everything from household messes, to hands and faces -- and don't forgot all your outdoor activities. Our towel is an amazing Ec'o-Friendly and wise solution helping to reduce over-dependency on paper towels, tissues, napkins, wipes, and cloth-products requiring repeated laundering. " It's so Ec'o~Logical "
Thanks for taking time today to learn more about Gertrude's Green Ec'o Towels -- I look forward to reading your comments and am happy to answer questions. These little wonders do a big job in cleaning up messes and spills in our house. I use one as a Bib when I eat Spaghetti, then just rinse it out if I get sauce on it. try them, you will love using them over and over. I use these towels for just about everything when I go camping. I keep a good supply in my RV. At home I use these for the extra dirty jobs like cleaning my Air Cleaner elements. They are a great product and I am also thinking about using them as a promotional item with my business cards. I LOVE THESE THINGS. I use them when I go hiking/bird watching to cool down and they are lint free - so I can clean my camera lens, binoculars and sunglasses without scratches. GENIUS! Yes, it's terrific as a bib, good idea. Have you tried using it dry. After you wet it to open just let it air dry, it dries quickly, then carry it with you dry for your personal needs and outdoor activities. Thanks. The towels are great for campers. Glad to hear you use them at home as well. You are right, they are a good promotional item for businesses. Thanks. I love this towel, this is best to remove lint from your clothing and it does not leave a residue. I always carry them in my purse! I love these towels and so do all my friends who I show them to. I use them to clean spots on my car and spots on my clothes. I keep them in the car and also use them while traveling. They have a million uses and I highly recommend them. This is convenient for me to carry around on the construction site. They fit in my pocket they are durable, and re usable. The towels are great for cooling off and cleaning up on those outdoor jobs. Thanks. My friends and I especially like these towels when we are fishing and golfing. Recently we discovered they are terrific when working on our vehicle's, checking fluid levels, wiping away grease, cleaning mirrors. We like the reusable container! love this towel. my favorite use removing eye make up. I also carry them in my car and purse. As I'm typing this my son keeps piping up saying and it's great for getting cat hair off your face. :0) We DO like the towel. These towels are absolutely fabulous!! I use them for gently removing make-up (works especially great for heavy-duty mascara in my case), cleaning my sunglasses, and washing my handsthroughout the day. I carry purell with me in my purse and use these together, I just add a little water and then a dollop of sanitizer, and it gets rid of the normal sanitizer residue that's left. Saves me time from having to go to a restroom just to wash my hands, the perfect solution for a busy and scatter brained college student:D Keep 'em comin, guys! For those of you that use paper towels to dust, I highly recommend switching to these eco friendly towels! I used to use paper towels to wipe down wood surfaces in the house - not only would I have sneezing fits from all the cleaning, but there was also the agony of dealing with all the lint that gets left behind. These towels pick up dust very easily and are much softer and more environmentally friendly to use. They are so conveniently small and compact that I also keep a few in the car. They are great for anything (i.e. cleaning your hands after checking the oil, putting air in the tires and of course those accidental spills). These towels are a life-saver!! OK, I just cleaned a bunch of windows this weekend and kept switching between a rag (no waste) and paper towels (more effective), but both left a lot of lint on the glass. I like the window cleaning use idea. I wish I'd had these with me Gertrude! This product is absolutely fabulous! You have a washcloth with you 24:7 and they are so handy for the unlimited uses. I have used them to wash my fruit and then to clean my fingers after eating lunch. You have a towel at your fingertips if you dribble and need to wipe off your clothing. If you are like me and eat at your desk, you can remove that sticky keyboard too! And while you're at it, just wipe off your monitor, mouse and telephone. These towels can be used for for several little projects at once. Carry them with you at all times - in your purse, book or lunch bag, automobile, pocket, on the counter, etc. Try it! You'll like it! Cannot live without it! They are good for removing make up, especially around the eye area because they are soft yet durable. You can ad whatever you want to your wet towel or use it plain. Glad to hear your son likes to use the towels, you can also clean your cat with one of the towels. Thanks. I wanted to add that at Daily Grommet we've found these useful in the office. The towels are 99% lint free so we've found them to be as good as a microfiber cloth on our computer screens and keyboards. They really get into and clean up those hard to get at corners and crevices too. What a great idea for those on the go college gals and guys. It will help control the spread of germs. Pass them along to all your friends. Thanks. Switching from paper towels to our Green Ec'o Towels has not only helped you but is also helping the environment. 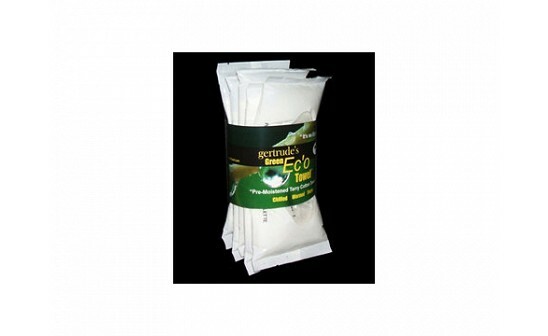 Our Green Ec'o Towels are so much more effective and they can be rinsed and resused. Glad to hear you have found so many other uses for our Green Ec'o Towels. As we say "It's so Ec'o~Logical. Thanks. No time like the present to make your switch from rags/paper towels to our Green Ec'o Towels. Our product is there to help you. Use our towels on all your cleaning jobs, remember you can rinse and resuse, or air dry and resuse. Thanks. Glad to hear you have found so many uses for our towels. Sounds like you know to rinse and reuse and reuse and reuse. Thanks. What a great endorsement from Daily Grommet. It is so much fun to work with all of you and we look forward to the future. The Staff at Daily Grommet are supportive, professional and helpful. Thanks. With all these people raving about the "lint free" quality of these, I decided I couldn't pass up the "Free Shipping" offer today so I went in to Grommet to buy one. But I ended up buying two. These towels are great!! I live on a golf course, and always keep some in the golf cart, both for me and the other golfers. They are great for cleaning off your clubs. I put a damp E'co Towe on my neck to help keep cool in the Texas heat. They are so handy in so many other ways, such as wiping off my dog when she gets a little messy. I love that they can be used and rinsed and re-used: How convenient! Thank you for these towels. Since you signed Aunt Edna and Uncle Jerry, I felt I can call you that. I like sharing our Green Ec'o Towels with our expanding Ec'o Families. Our towel is degradable, compostable and recyclable. As we all know, there are two environments that of the world and our personal homes and offices. Thank You for trying our Green Ec'o Towels. That's a great way to stay cool on a hot Texas golf course. These towels are great on dogs or cats and you don't have to worry if your animal has any allergies because they are unscented and have no harmful chemicals. Thanks for sharing the towels with the other golfers. I bought these recently on a trip to Ca. I stopped at this 50's cafe in the desert I picked some up and I love them. However, when I got back home my truck driver brother talked me out of the rest of them. So, I will be ordering more. Love that these are unscented too!! I have two labs and a baby and use so many paper towels. on paper towels. I can't wait to try them. We are always happy to have people try our product. Thank You for ordering thru the Daily Grommet. We know you (family, friends and colleagues) will be pleased with our Ec'o Friendly towels and our resuable and recyclable BPA Free packaging and look forward to having you as a continuing customer. As a thought, these make a wonderful gift especially for the fast approaching holiday seasons. Enjoy !! How many "towels" are included in the package? How many times can they be re-used? These towels are great when I golf. I use them to clean my clubs and help dry perspiration. For the golfers out there that try to keep a course clean, they serve the added purpose of being eco friendly when you're out there. Hey, Gertie! The towels are great for camping..Come to Tejas and we'll go camping! Oy vey...just cleaned a ton of windows this weekend (very eco-unfriendily I must admit)...but tomorrow's another window. Thanks Team Grommet for discovering another cool "gotta have" item. Having a dog of myself, I know they are great to use on dogs. The towels are hypo-allergenic and unscented so there are no worries if your dog has allergies, my dog does and these are the only towels I can safely use on her. That is why they are also good on the sensitive skin of a baby, you can also put anything you want on the wet or dry towel. Thanks for wanting to help save the environment as well as saving some money. I can't wait for you to try them also, I know you will like using them. Thanks. 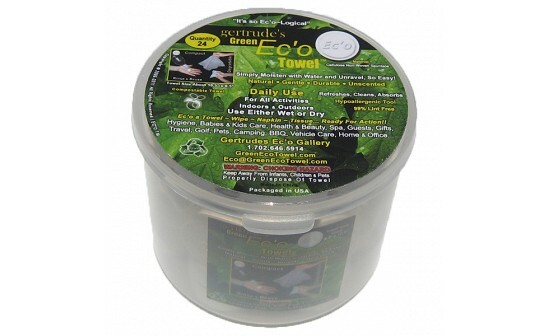 There are 24 durable, natural and unscented towels in our reusable and recyclable container. 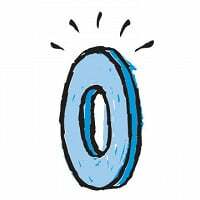 There is no exact number of times our Ec'o Friendly Towel can be rinsed and reused. It depends, of course, how the towel is being used. As a guideline for utility purposes, it likely could be reused 4 to 6 times if not more. For example, I use it for my eyeglasses and it has lasted a dozen if not more times of use. The towel needs to be disposed of properly, perferably by recycling or composting. If you have any other question, please let us know. Thanks. You have mentioned good reasons to have the towels with you when you are golfing, they are great for cleaning your golf clubs, keeping you refreshed and they are an Ec'o Friendly item. Here's another, the reusable container can hold your markers and tees. Thanks. These magic little towels are the best! We take them camping, they go in the car, in the diaper bag, use them around the house, the list goes on and on! They hold up really well, so they can be re-used, and they are so small when new, you can take them anywhere with out sacrificing space! Thanks for inviting me camping, next time I'm in Texas I'll look you up. Remember to share the towels with you neighboring campers and spread the word about gertrude's Green Ec'o Towels. Thanks. A friend a mine turned me on to the Ec'o Friendly towels when I was on a Girlfriend Vacation in Vegas and now my husband does not think he can live without them. He loves using them when he rides his motorcycle. They are very portable, just add water or a cleaner and they are ready for use. He also loves them for use when golfing or just daily use around the house. They are a great product! What a great idea to have them at the campus stores. Thanks for thinking of the environment today and for the future. Our towels are beginning to show up in a wide range of retail venues. I'll get to work on the campus stores that you suggested. Thanks. I see you keep your towels in many places so they are handy for their many uses and reuses. Thanks. Glad we could be of help with our Ec'o Friendly Towels. Thanks. Our towels are great for cooling a Motorcycle riders after a long hot ride as well as quick cleaning of the bike. I've heard they sometimes wet the towel and put it under their helmets or wrap a wet towel around their necks while they ride. Hope he left you some to use around the house. Thanks. Having our Ec'o Friendly Towels unscented is one of the many reasons people like to use our towels. They are great for a fast clean up before heading home. Remember to share your towels with you friends. Thanks. What a nice compliment to have gertrude's Green Ec'o Towels given as a complimentary ec'o towel to guest at your B & B. We have been told our Ec'o Friendly Towels are very popular with professional guide services like fishing, hiking and rafting. Glad to hear your guest like our towels and are asking for more. Thanks. In answer to your question, "Great idea. How did you come up with it?" .... I thought to myself one day there has to be a better way that's more effective and practical than going thru endless rolls of paper towels, wipes, dish cloths etc. Those seem so wasteful and generally yield lousy results. So you could say it was born out of necessity, and, I wanted my solutions to be Green and Ec'o Friendly. I can honestly say the responses have been overwhelmingly positive!! On the lighter side, I have a personal goal to eliminate messy wasteful paper towels, wipes etc. Never thought to use the towels for eye make-up. Thanks for the great idea. I love using them to wipe my dog Dudes' face and then rinsing them out and giving his whole body a wipe down. Then giving the floor a wipe also. when I clean carpet in vacant houses with no A/C in Las Vegas I wet my towel put it around my neck and I'm cool. I use it to wipe up excess chemical spray on tile, I use it to clean my glasses AND my customers absolutely LOVE this product. My customers want them for their own personal use so I supply them. And the kid's think their amazing. An Ec'o Friendly Towel for carpet cleaners, thanks for using our towels for both your business, personal use and spreading the word to your customers and their families. We enjoy hearing all the possibilities of our towels. Have you mentioned to your customers how great our towels are for backyard BBQ's, grilling and other friends and family gatherings and events. Thanks. I can only tell you that I use these to clean my wooden shades, rince and reuse as I clean 16 sets of shades and only use two towels for all of them. I also save money by putting them on the end of my swifter mop and dust and wash my hardwood floors. I also have them by by computer and do they ever hold the dust when cleaning the glass. I love Eco Towels. This product is AMAZING. I use them nearly every day for so many different things. I would reccomend them to anyone! What great cleaning tips. Perhaps this will be helpful for other. We are finding out more uses for our Ec'o Friendly Towels. Thanks. We are glad you are spreading the word about our Green Ec'o Towels. I'm very positive everyone can find many uses for our durable Ec'o Friendly Towels. Thanks. We were told when you are fishing you can use the Towels for cleaning that fishy smell from you hands. Also if you wet the towel and wrap it around your neck it helps to keep you cool or if you are wearing a hat wet one of the towels and place it under your hat. Just some little helpful hints. Thanks. Hey Gertrude, what a fabulous product you've got here! Talk about a multi-tasker, I use these fabulous towels to clean all my windows and mirrors as they leave NO LINT! I also use them to remove my make-up. They're so much more cost effective than those expensive make-up removal products and they are so soft and gentle on my skin. I have very sensitive skin, so I always have an allergic reaction to a lot of other make-up removal products, but these are fabulous! They even remove waterproof mascara in a flash! Thanks Gertrude! Economical, effective, natural, Ec'o Friendly it offers it all. Glad we can be so helpful in supplying the right product for your needs. Thanks. This is such a brilliant product! We recently got a puppy, and there are no shortage of spills and mess-ups around the house. The towels are immensely handy for this, and for a multitude of other purposes throughout our home. We also love how easy they are for when we're on-the-go. Their small, ultra compact feature is the best part. We always carry a few in a snack-size zip lock bag. The function and convenience is great! I bet people with babies and small children could really appreciate it, too. Thank you! As you stated, our towel is ready for multi-purpose actions. Since it's compact and nicely packaged, you can keep it in your carry alongs, home, vehicles, as a utility towel for just about any situation. I'm thrilled to hear you find our product to be helpful, effective and easy to use. We agree of course. Thanks. I would like to Thank everyone for taking time out of their busy schedules and stopping by the Daily Grommet to share their daily uses as well as their interesting and helpful tips for our Ec'o Friendly Towels. I have enjoyed hearing from each and everyone of you. I know you will continue finding more and more use for gertrude's Green Ec'o Towel.....after all........"It's so Ec'o~Logical"
We offer our sincerest Thank You for featuring our Ec'o Friendly compact, natural and degradable Towel. To summarize the expression WOW comes to mind. The Daily Grommet Team is impressive and all of you handled our Ec'o Friendly Product with terrific results and professionalism. We will highly recommend Daily Grommet to everyone we meet and we look forward to a mutual and continuing future together. By the way, it's fun and easy working with you. Somewhat to my surprise, I recently had a case of shingles. These little cloths were perfect for soaking the itchy painful skin rash. I could fold them to just the right size, and rinse them out and use them over and over again. I knew they'd be good for household tasks, but I never imagined how much they'd come in handy as a medicinal aid too. @Kate - we hope that you are feeling better, that does not sound fun. 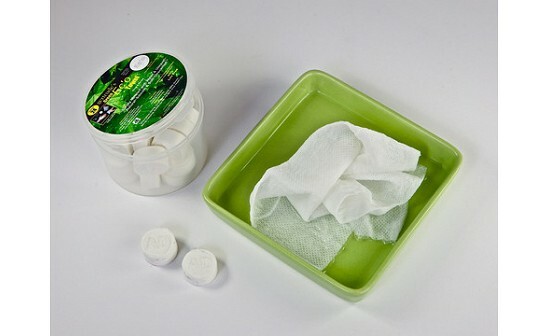 We are glad that these amazing little towelettes did the job for soothing your rash. Thanks for stopping by! About how many washings will these wonders go through? @mona: Gertrude answered a similar question in this way: "There is no exact number of times our Ec'o Friendly Towel can be rinsed and reused. It depends, of course, how the towel is being used. As a guideline for utility purposes, it likely could be reused 4 to 6 times if not more. For example, I use it for my eyeglasses and it has lasted a dozen if not more times of use." Here’s a riddle for you: What starts out as big as a coin, expands to the size of a washcloth, and can make your whole house sparkle? If you guessed Gertrude’s Green Ec’o Towel, you’ve cleaned up — literally. These towels are the creation of entrepreneur Gertrude Skinta (pictured on right), who wanted a portable, environmentally-friendly alternative to paper towels, tissues, and disposable wipes that litter our landfills. 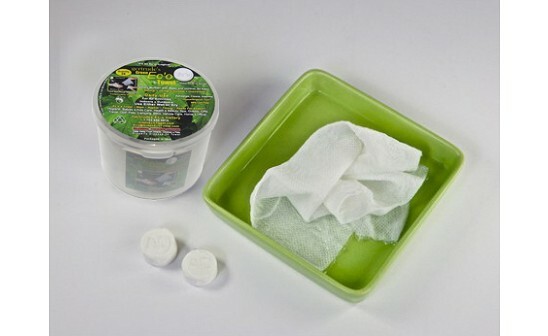 When moistened with water, her dime-sized tablets expand to the size of a typical washcloth (sort of like those expanding bath sponges for kids). In your home, the Ec’o Towel works great on spills, sticky fingers, or smudged glass. Everywhere else, the lightweight towels make cleanup convenient. Just throw the tablets in your backpacks, golf bags, lunch boxes, glove compartments, purses, and diaper bags and they’ll be there when you need them.